You might have seen this colourful ingredient popping up on Japanese restaurant menus – but what is it? And why is it such a popular ingredient in sushi? Crunchy, salty and with a hint of smoke – tobiko has quickly found its way into the UK’s top sushi restaurants over the past few years. They’re the small, orange, pearl-like blobs that sit on top of sashimi, maki and other raw fish dishes from the country, offering some much needed crunch to the softer textures of rice and raw fish. 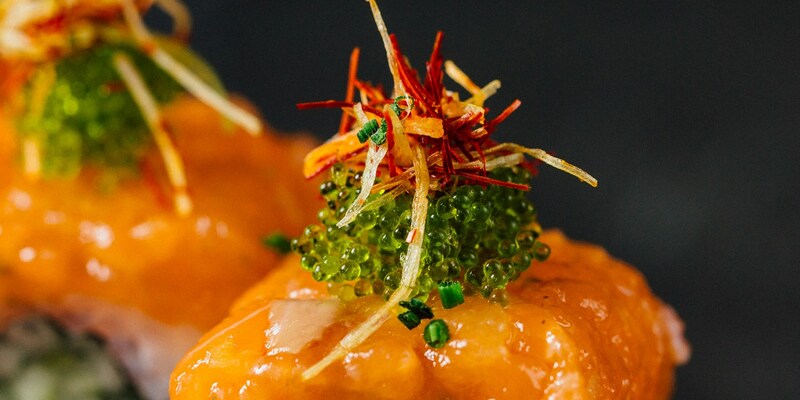 As you may have guessed, tobiko is a type of fish roe (or caviar). It comes from flying fish, and while it looks similar to salmon roe (known as ikura in Japan), the eggs are much smaller and differ in texture. They’re often used to garnish dishes, and more extravagant sushi platters are piled high with the roe as a sign of wealth. However, you may have seen something that looks like tobiko that’s jet black, bright green or pale yellow in colour. This is just the roe infused with other ingredients, allowing the eggs to take on the colour and flavour of something else. They can be so bright and vibrant that you’d be forgiven for thinking that they're artificially coloured, but the eggs' translucency simply means they take on the colours of other ingredients particularly well. So there you have it – next time you see tobiko listed on the menu, give it a try – the crunchy eggs and variety of flavours brings something new to Japanese cuisine, and knowing the story behind it seriously ups your sushi master credentials.